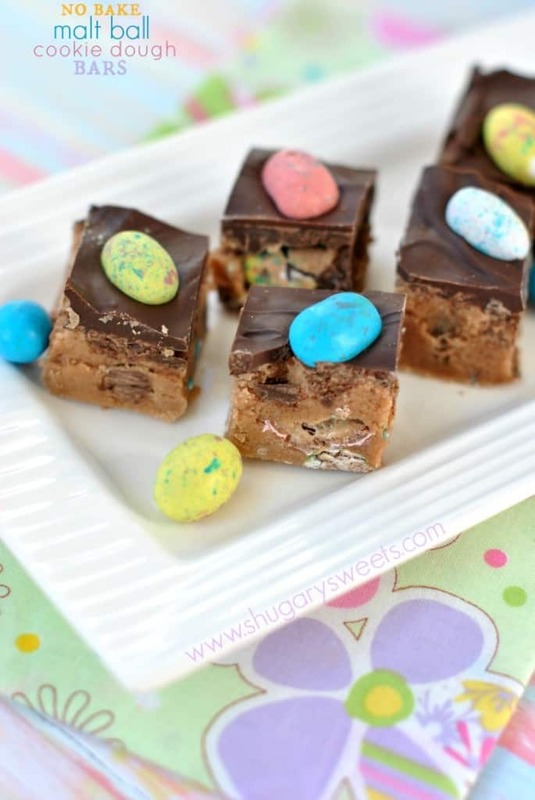 These Malt Ball Cookie Dough Bars are no bake treats that are perfect for Spring! I used Robin Eggs malt balls, but you can use Whoppers too! A few weeks ago I made some Peanut Butter Cookie Dough Bars, and my life changed. Seriously, no bake cookie dough bars are going to be the next big thing. Move over cronut! Okay, maybe it’s not that big of thing. After my family polished off the entire batch of Peanut Butter Cookie Dough Bars I knew I had to try another flavor. I just happened to have several bags of colorful Robin Eggs in my pantry. Instead of eating handfuls of them at a time, I put them in today’s recipe. I also added some Rich Chocolate Ovaltine to the cookie dough. It added some chocolate flavor, and extra “malted” taste! Do any of you buy Ovaltine? My kids have always LOVED it. Instead of buying gallons of chocolate milk or chocolate syrup…we use Ovaltine. It’s also great in homemade milkshakes! And Ovaltine is full of vitamins. So basically what I’m getting at, is you can eat these cookie dough bars and get your vitamins. I mean, seriously, health food (reaching??). 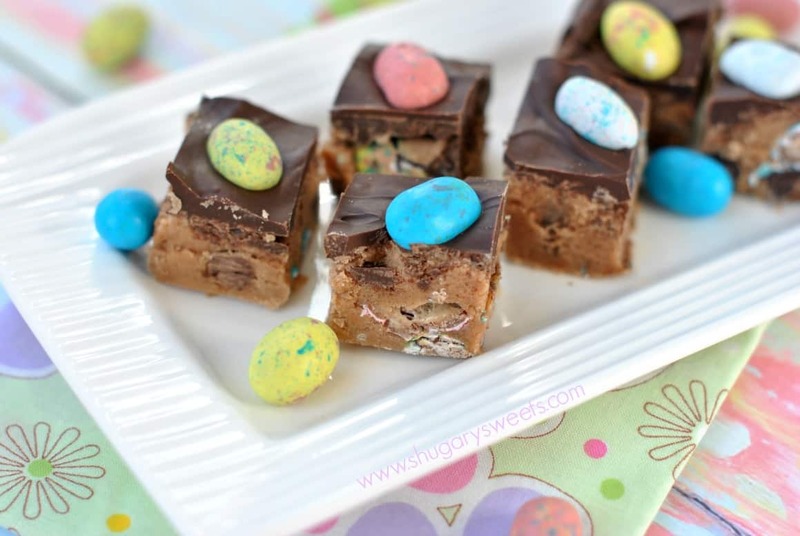 If you can’t find Robin Eggs you can use Whoppers in this recipe. Add some colorful sprinkles on top of the chocolate and you’ve got a beautiful pop of color and fun! Now, who’s ready for some REAL spring time weather? It’s not the same eating these colorful spring treats while the snow is falling outside! I’m ready to put my jackets and gloves away for awhile and enjoy some warm sunshine. Our Spring Break starts next week, and I am looking forward to turning off the computer (sorry friends) and enjoying the great outdoors! Be sure to follow me on Instagram so you can see what our adventure entails…..
Easy, no bake cookie dough bars packed with malt ball flavor! In a large mixing bowl, beat butter and brown sugar until fully combined. Beat in vanilla and Ovaltine. Add flour and sweetened condensed milk, beat until blended. Fold in malt balls and semi sweet chocolate morsels. Press dough into an 8inch square foil lined baking dish. 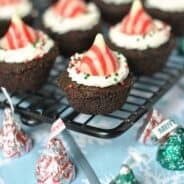 For the frosting, melt milk chocolate morsels with heavy cream in microwave safe dish for one minute. Stir and cook an additional 30 seconds until smooth. Spread over cookie dough. Add extra malt balls to top of frosting in rows (where you will eventually cut into bites). Refrigerate for 3 hours (or overnight). Cut into squares and enjoy. Store in an airtight container for up to one week in the refrigerator. ENJOY. Chewy Malt Ball Cookies…can be made anytime of year using Whoppers too! 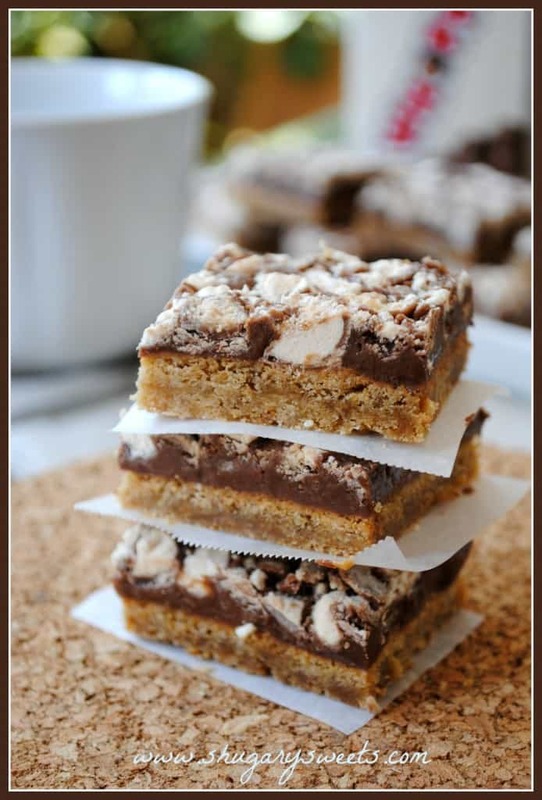 Whopper Cookie Bars…malted cookie base with a layer of fudge and crushed Whoppers. YUM. Malt Ball Mini Cheesecakes…delicious individual cheesecakes topped with chocolate ganache and crushed malt balls. More Malt Ball recipes from my favorite blogs…. I’m about to jump on the cookie dough train. 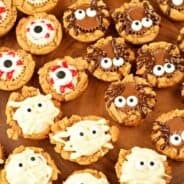 I just can’t stop thinking about different recipes! I love that you put the malt balls in these, I have a whole bag in my cabinet begging to be used! Those look absolutely fantastic! I can’t wait to try making some myself. Robin Eggs are my favorite easter candy – love this! 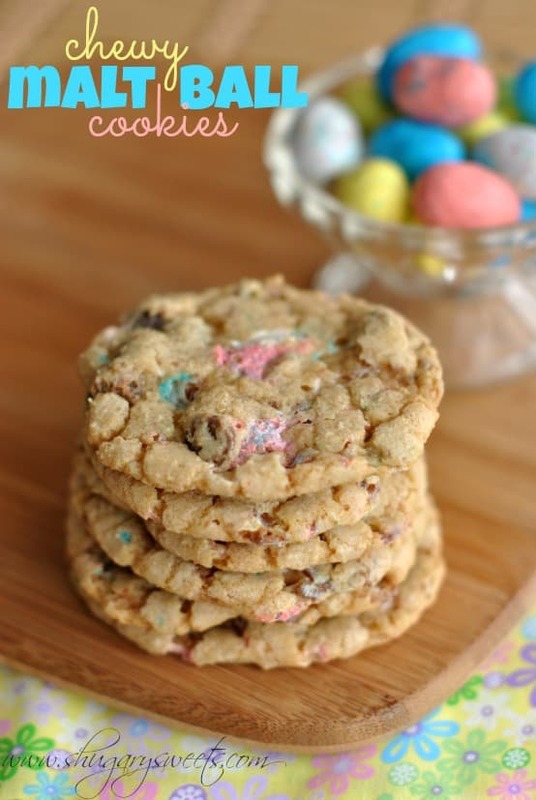 And such a fun cookie dough variation! These cookie dough bars have my name written all over them. 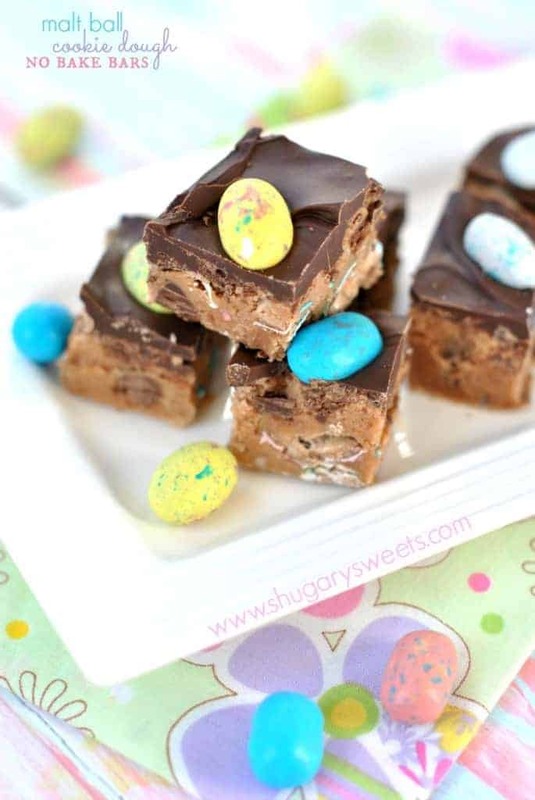 Love seeing robin eggs being featured here – they are one of my favorite Easter candies!! Can not believe we have hit the malt ball season! And these no bake treats! I need to get on that train as well! 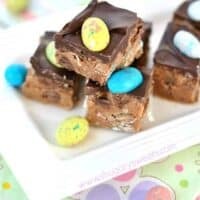 nobake cookie bars are serious gamechangers and these look SO cute and sooo tasty! Seriously — these sound so good — especially with the malt eggs! A must try! I am totally in love with this fudge! And I think you argued a good case for this being healthy as well. These look so good and I love whoopers! Cookie dough truffle bars as the next big thing…YES!!!! I am totally jumping ship from rolling and dipping for now! And Ovaltine as healthy…I can get behind that for sure!!! dude ovaltine is my JAM! Also, after last summer, I am storing all the no-bake recipes I can find for Summer 2014. I NEED MY SWEETS but not in 95 degree weather. Ew. 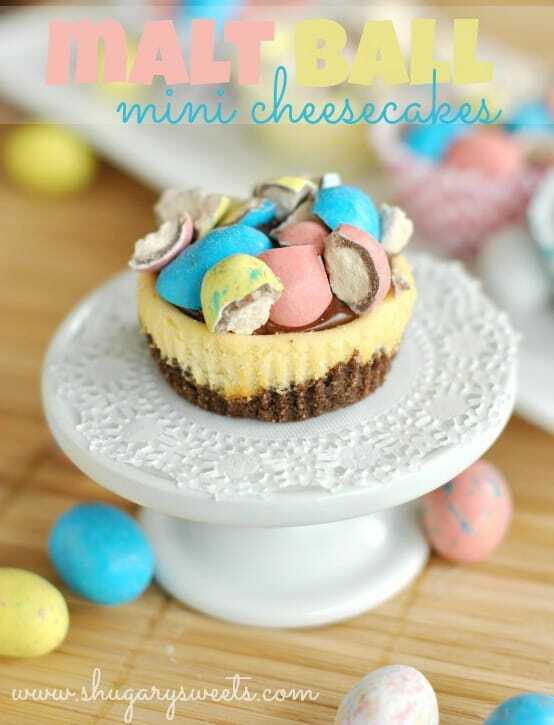 These look ahmazing though, and perfect for Easter coming up! Love treats with malt balls! These cookie dough bars are definitely the next big thing! I love that you just made cookie dough truffles in bar form, because they’re such a pain to dip in chocolate! I’m all about simplicity, and these look so easy and delicious. Robin eggs are my favorite Easter treat! Bring on spring and all of its pastel coated candy! Love these. Pinned! Ooooh these look perfect! I cannot wait to give them a try! I love malted foods, and I very rarely see recipes for them….well until I found this post, now I have a lot 🙂 Robin eggs are amazing! I wish they sold them year round! Look at you and all of your malted desserts!!! These look so perfect for Spring (even though it doesn’t feel like it here!). What a delicious Easter treat! Anything “cookie dough” and you’ve got my full attention! These look fantastic! I’m a huge cookie dough and malt ball fan. 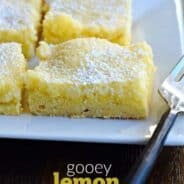 I will definitely be trying out this recipe! I never had Ovaltine as a kid, but I do enjoy sprinkling malted milk powder on top of my ice cream! Thanks Lauren, it was a big hit in our house!